If you’re looking for new ways to monetize your website or blog, take a look at the topics and resources listed here and I think you’ll find some great options. One of the most popular methods of monetizing a site or blog is to sell advertising space, usually banner ads. You could manage this manually, but it is much more efficient to either use a network or a plugin/resource that will automate much of the process. 1. BuySellAds – A popular network that manages advertising for publishers and advertisers. 2. BuySellAds Pro – A professional-grade advertising solution from BSA. 3. OIO Publisher – Probably the oldest and most-used WordPress plugin ($47) for managing ad sales. 4. WP AdCenter – A popular and comprehensive ad management plugin for WordPress ($49). 5. AdSanity – Another popular and feature-rich WordPress plugin ($29) for managing ads. 6. AdPress – A premium WordPress plugin ($40) with advanced ad management features. 7. Banner Manager Pro – A WordPress plugin ($21) for selling and managing banner ads on your site. 8. The Deck – An long standing invite-only ad network that targets the web design industry. 9. Carbon – An invite-only ad network, now owned by BSA, that focuses on the design and development industries. 10. Fusion Ads – Also and invite-only network that is owned by BSA targeting the creative community. 11. Yoggrt – Another invite-only network from BSA that targets the creative community. 12. Smaato – Mobile advertising network. Placing ads within the content of your pages is also an option. 13. AdSense – Google’s contextual advertising solution is one of the easiest ways to monetize a website or blog. 15. Infolinks – Infolinks is a popular option for in-text ads. 16. Kontera – A contextual advertising solution that has been around for years. 17. Result Links – Focusing on in-text ads. 18. Yahoo Bing Network Contextual Ads – Contextual ads powered by Media.net. 19. Clicksor – They offer inline text ads, banners, popunders, and more. Affiliate programs can be extremely lucrative to top earners, and one of the great perks is that there are affiliate programs available in just about any industry or niche you can imagine. You can sign up to promote specific products by joining the affiliate program of particular companies or websites, but large networks also represent a huge number of companies and products. Affiliate networks make it a little bit easier to manage because you can get all of your links and stats in one place, plus payouts for all programs within the network will be combined. 20. CommissionJunction – A huge network with options to promote products in just about any industry. 21. ClickBank – The leading affiliate network exclusively for digital products. 22. Amazon Associates – While it’s not really a network, Amazon sells so many different products that their affiliate program can be used by just about any website or blog. 23. ShareASale – Another large affiliate network with many products to promote on your site. 24. ClickBooth – Offer CPA and CPC options. 25. Rakuten Marketing – A major affiliate network that represents many leading brands. 26. GlobalWide Media – Another popular affiliate network with a lot of options. Selling products at your own website is one of the best ways to take your monetization to the next level. Here are some great resources for getting your own shop setup. 27. Shopify – A super-popular and feature-rich hosted e-commerce platform. 28. BigCommerce – Another popular and feature-rich e-commerce option. 29. Highwire – A hosted e-commerce platform that includes features like selling on Ebay and Facebook. 30. Magento – An extremely popular open-source e-commerce platform. 31. osCommerce – Another popular open-source option. 32. DPD – A simple e-commerce system that is great for selling digital products. 33. E-Junkie – A popular option for selling digital products, although you can use it for tangible products as well. 34. WooCommerce – The leading free WordPress plugin for e-commerce. You can purchase option add-ons from their store to add specific functionality. 35. WP e-Commerce – Another popular free WordPress plugin with premium add-ons available. 36. Cart66 – A premium WordPress e-commerce plugin. They also offer Cart66 Cloud which is a combination of a WordPress plugin and hosted e-commerce. 37. Easy Digital Downloads – A free WordPress plugin for selling digital products. 38. Gumroad – Gumroad makes it easy to sell your digital products. If you sell your own products, adding an affiliate program is an effective way to increase sales exponentially. You’ll allow others to promote your products in exchange for a commission on any sales that they refer. Most affiliate software options offer many of the same features, so I won’t list details, but here are several options. If you use WordPress for your website there are a number of plugins that can help for setting up your affiliate program. Selling memberships is another excellent monetization option. You can generate recurring revenue by offering members access to exclusive content or resources.There are several different ways to make money with membership websites in the design and development industries. A well-recognized example is Elegant Themes, one of the leaders in the premium WordPress theme market. While most WordPress theme shops sell themes individually, Elegant Themes offers their themes through a membership format, and they’ve had well over 300,000 customers. 49. aMember – The most popular software for managing membership websites ($179.95), aMember integrates with a wide variety of CMSs and platforms. 50. Wishlist Member – Probably the most popular WordPress plugin ($197) for managing a membership website. 51. Restrict Content Pro – A solid membership plugin for WordPress ($42) that doesn’t include extensive features but is very user-friendly. 52. Member Mouse – A robust membership plugin for WordPress (starts at $19.95 per month). There are also a few resources that help you to make money by selling access to premium content on your site or blog. 54. Pivotshare – Sell premium video content. 55. Piano – Build a revenue stream based on payment for access to premium content. 56. Cleeng – Sell premium content including videos, e-books, live events, and newspapers. Sponsored reviews and blog posts used to be more popular a few years ago, but there are still some options for leveraging your blog to make money from publishing sponsored content. 57. PostJoint – Accept paid content for your blog. 58. SponsoredReviews – Get connected with advertisers looking to pay for blog reviews. 59. SocialSpark – A marketplace find advertisers who want you to review their products. One easy way to make a little extra money is to join the affiliate program of whatever company is hosting your website. Almost every host offers an affiliate program and you can place an ad or link on your site that says “hosted by ABC Company”. If you’re looking for a new host you may want to consider one that has a great affiliate program. 61. Bluehost – A very popular host with an extremely popular and effective affiliate program. 62. HostGator – Another leading host with a generous affiliate program. 63. WPEngine – They specialize in managed WordPress hosting and they feature a high affiliate commission for referrals. 64. MediaTemple – A leader in the hosting industry with a potentially-lucrative affiliate program. Another option is to create an industry-specific job board on your site, and charge companies to post a job listing to be seen by your audience. The following options will all make it easy to setup your own job board. Online training and education is a huge industry. You can leverage the expertise and reputation that you have developed by creating and selling your own courses. There is plenty of demand for online training related to design and development. Sites like Udemy allow you to sell your own course to a large, established audience. Alternatively, you could set up the course on your own site and sell access to it. Creating an online course will require some time and effort, and you’ll obviously need some expertise on the subject at hand, but the potential is there (see the real-world example below). With so many sites offering online education in the industry there is plenty of competition, but there are also plenty of people looking for this type of training and education. Many bloggers also publish podcasts, and podcasts offer some additional opportunities for ad revenue and sponsorships. 77. Podtrac – Podtrac connects podcasters and advertisers. You can sell products via auction using these WordPress plugins and themes. For those of you who are using WordPress, there are a number of plugins that don’t fit perfectly into any of the categories before. Each of these plugins has it’s own unique functionality that helps you to make money in some way. 81. 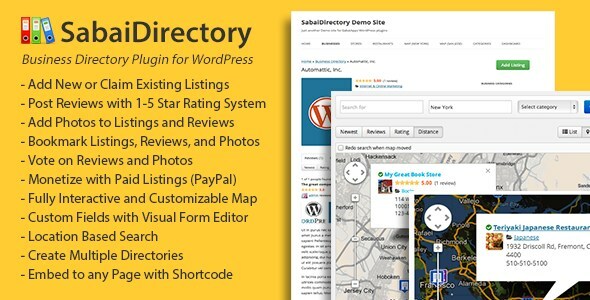 Sabai Directory – This plugin ($29) allows you to add a directory to your site, and it integrates with PayPal to accept payment for directory listings. 82. Page Peel Pro – Use page peel ads on your site with this plugin ($16). 83. Easy Plugin for AdSense Pro – Use this plugin ($18) to sync AdSense with your blog. 84. Advert Flap Pro – Create unobtrusive ads that will get your visitors attention by using this plugin ($16). 85. Interstitial Ads – Use this plugin ($21) to show ads that your users will see between pageviews. 86. Wp-Insert – A free plugin that will insert ads into specific locations within your content. 87. Google AdSense – A free plugin that makes it easy to implement AdSense into your WordPress website or blog. 88. WP Auto Affiliate Links – This free plugin will automatically create affiliate links within your content based on keywords and affiliate programs of your choice. 89. Amazon eStore Affiliates Plugin – Use this plugin ($36) to build a store featuring Amazon products. 90. Paid Downloads Pro – Sell any digital content easily with this plugin ($21). 91. WooCommerce Group & Daily Deals – This plugin ($21) allows you to get daily deal site functionality, and it integrates with WooCommerce. 92. FooBar – Add a notification bar with this plugin ($17) to get more attention for an affiliate link or a link to one of your own products. 93. WordPress Notification Bar – Superbar – Another popular plugin ($21) for adding a notification bar. 94. WP Header Bar – This plugin ($19) allows you to create responsive notification bars with a lot of different features. 95. Notification Bar for WordPress – A notification bar plugin ($15) with plenty of customizable options. 96. WP Pre Post Advertising – This plugin ($12) shows an ad before the actual post/page. The ad includes a countdown and when it reaches 0 the page/post will be shown. 97. 5sec Link Remover – This plugin ($10) allows you to show links only to registered/paid users. 98. Pretty Link Lite – A free plugin (premium version also available) that is great for shortening your affiliate links. 99. Simple URLs – Another free plugin for creating shortened links. 100. WP125 – This free plugin allows you to manage and rotate banner ads. 101. AdRotate – A free plugin for managing ad spots on your blog. A pro version is also available. A common approach to making money as a designer is to sell stock graphics (PSD files, logo templates, Photoshop brushes, vectors, icons, etc). Marketplaces like GraphicRiver, Creative Market, and major stock photo sites like iStock allow designers to sell their own creations to a large existing audience. The down side of selling at these types of marketplace sites is that you will need to share the revenue with the marketplace, and in many cases you’ll also face restrictions related to pricing, the types of products you can sell, and exclusivity. Of the major marketplaces, Creative Market provides the most flexibility and fewest restrictions for designers. They don’t require exclusivity (you can sell your products at your own site or at other sites), you can set your own prices, and they offer 70% of each sale to the designer. If you design websites for clients a possible alternative source of income would be to create and sell website templates. You could sell static HTML/CSS templates, or templates for a specific content management system. The WordPress theme market has been huge for several years now, and it shows no sign of slowing down. The process of selling templates is a lot like selling stock graphics. You can either sell at your own site, or sell at large existing marketplaces. The most popular marketplace is ThemeForest, but sites like Creative Market, Mojo Themes, and ThemeTrust also offer excellent opportunities. If you’re more of a coder than a designer you may prefer to create and sell plugins or addons as opposed to templates or stock graphics. The market for WordPress plugins is huge, and there are countless opportunities for possible plugins that could be created. Aside from WordPress plugins, some platforms like Shopify include a shop where developers can sell their own addons. Your plugins could be sold at your own site, or you could sell at a popular marketplace like CodeCanyon. Designers can never have too many fonts. That means that there is an on-going opportunity to design and sell fonts. The approach is pretty similar to selling other types of stock resources or templates. You can set up a shop on your own website, or sell at marketplaces like GraphicRiver and Creative Market. Although there are no shortage of fonts already available, and many of them for free, there is plenty of demand for high-quality fonts.